Jaws Jr! Great White caught aboard CaribSea. Close to 800 lbs! 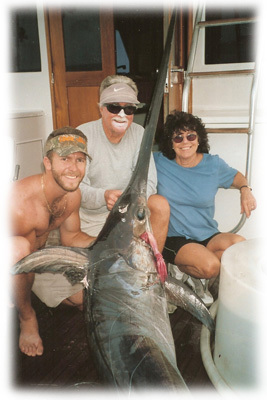 Dietmar Kossmann, Richard Stanczyk, and Ricky Stanczyk with a nice mako shark! An 850 lb Mako shark jumping 30 feet in the air! Caught aboard The Reel McCoy! Capt. George McElveen! Big Whale Shark comes up behind the boat! Yikes, wait he won't eat you! Young Ricky Stanczyk and a huge tiger shark. Lucky he didn't eat 'em! Our friend Dr. Stein, and a nice bull shark! Yikes! Capt. David Applegate and a nice nurse... nurse shark that is! A nice little hammerhead shark! A hammerhead in the water right behind the boat! Capt. Skip nielsen with his angler and a big Lemon Shark on fly! This large bullshark gets in some skinny water to chase a bonefish! Capt. George McElveen with an 850 lb mako! Got some teeth!